A transit of Venus across the Sun as seen from Uranus takes place when the planet Venus passes directly between the Sun and Uranus, obscuring a small part of the Sun's disc for an observer on Uranus. During a transit, Venus can be seen from Uranus as a small black disc moving across the face of the Sun. Naturally, no one has ever seen a transit of Venus from Uranus, nor is this likely to happen in the foreseeable future. Nevertheless, the next one will take place on September 22, 2028. 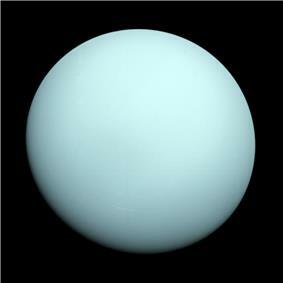 The Venus-Uranus synodic period is 226.347 days. It can be calculated using the formula 1/(1/P-1/Q), where P is the sidereal orbital period of Venus (224.695 days) and Q is the orbital period of Uranus (30,799.095 days). Transits of Venus from Uranus are empirically observed to occur in clusters, with two such clusters every 40 years or so.